Grand Superior Lodge #502 is a beautiful home near the Gitchi Gami Bike Trail, Split Rock Lighthouse, Gooseberry Falls, and the Superior National Hiking Trail. Premier log home at Grand Superior Lodge in Castle Danger. Grand Superior Lodge 502 is a cozy, private log cabin at Grand Superior Lodge. Located just a short stroll from a Lake Superior beach as well as many amenities offered in the main resort. Enjoy peek-a-boo views of Lake Superior from the front deck, or take a short walk to the shared cobblestone beach. Definitely a highlight of Grand Superior Lodge is this cobblestone beach that allows you to enjoy visiting Lake Superior. Step on into the living room of this adorable private oasis at Grand Superior Lodge. Light a fire in the wood burning stove and then curl up on the couch to watch a movie on a cold winter`s night. The couch in the living room is a sleeper sofa and is the third sleeping area in this home, making it large enough for up to 6 guests. The open layout of this home allows you to move freely between the living room, dining room, and kitchen. Seating for 6, comfortably, around the dining room table makes it great for enjoying meals or playing a family board game. The remodeled kitchen is a great place to prepare a home cooked meal during your stay. The first bedroom features a queen bed. The second bedroom also features a queen bed. The bathroom has a luxurious jetted soaker tub, perfect after a long day of exploring the North Shore. The bathroom also has a separate walk-in shower. Step out onto the deck and cook up a meal on the gas BBQ grill. Take the short stroll down to the water`s edge. These are the sites you get to enjoy while staying at Grand Superior Lodge 502. The cobblestone beach is shared with other resort guests, but you can usually find it empty with plenty of privacy. The large beach area is great for taking a stroll and skipping some rocks. There are three key factors when it comes to vacationing near Lake Superior. You stay in a cozy cabin. You have access to the lakeshore. Grand Superior Lodge 502 is a stand-alone unit at the Grand Superior Lodge located within a stone’s throw of Lake Superior. It checks off all three on the requirement list, and it doesn’t stop there. Think log cabin meets 2019 luxuries and you’re on the right page. Two charming bedrooms and a full bathroom (in case you were wondering… yes, there is a jetted tub) are perfect for the family, a group of friends, or two couples to embrace life near Lake Superior. Recreational opportunities abound with the seemingly endless options for hiking, cycling and angling opportunities found close by. One of Minnesota’s most iconic state parks, Gooseberry Falls, is a short drive down legendary Highway 61. In addition, Split Rock Lighthouse, likely the most photographed setting on the entire Minnesota shore of Lake Superior, is just minutes away from your cabin. 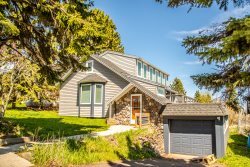 And while spring, summer and fall offer many unique aspects to enliven your vacation, winter is a popular time to enjoy this secluded home as well. Easy access to snowmobile trails, as well as an abundance of groomed cross country ski trails are literally found right out the front door. Dining options are plentiful from this unique setting, including the Splashing Rock Restaurant which is about less than one city block away from the cabin. For the record, in these parts we measure distances by rods, so in local talk the restaurant is about 200 rods from the cabin. In addition, Two Harbors is only 10 miles away and offers a collection of locally-owned restaurants to choose from. this was a very pleasant experience for us all! This was a wonderful location close to many hiking trails and things to do. It was my first time up to the North Shore and I felt the house was nice, clean and loved being close to the water. Everyone one was nice and helpful! We were very happy with our stay! The home was great for our family. It was a quiet location and everyone was respectful! Liked that there was a pool for the kids since the lake is too cold for them. Bonus that we can rent movies for Free with complimentary popcorn! My experience working with CVR was absolutely perfect. All of my needs and questions were addressed quickly, professionally, and with absolute kindness. It was one of the best customer service experiences Ive ever had. I couldnt recommend this rental service more. My sincerest thank you to everyone I had the pleasure of speaking with. The property was exactly as expected. It was clean and had everything we needed. The resort was excellent and loved by all of our guests. Nothing but an enjoyable experience. Many choices for lodging, very easy to work with! Have used Cascade Vacation Rentals before, will continue to use! Grand Superior is a great place to stay on the North Shore - full feel of the big lake and "up north," while still close enough to Two Harbors to gather supplies (groceries, gas, Cream Ale at Castle Danger brewery). Nice resort with fun, kid-friendly amenities and lovely buildings, views, trees. Cabin is small but in a nice spot if you don't mind looking at the back of another cabin for half of your view. Nice walk to the shore, plenty of trees around, a lovely spot to stay. always have had great service and timely information. all in all, the properties are great...Namaste Guest House still my favorite! appreciate the availability of pet friendly units. liked: size,kitchen amenities and bathroom nicely appointed. because of the warm weather, the bedrooms were very warm and stuffy..only one fan in the cabin to help with circulation. very clean, well kept. nice deck with a lakeview and enjoyed the beach area. Check in and check out was very easy (on line). The housekeeping staff that I met around the resort were all very friendly. I had a question about the house rules while staying there (how to take care of trash) and received an answer by email quickly. The cabin is beautiful and very clean. So thankful that you are pet friendly and have a somewhat private side yard. Loved the fireplace and used it every night. Everything was great. I hope to be able to go back soon. Im very pleased with the ease of this experience. I have never rented online through a third party, so I anticipated some bumps along the way. Everything was very easy, professional, and we had no problems. We will definitely use you again. Absolutely beautiful setting, picture perfect cabin, and great amenities at the lodge. We loved rock hunting on the beach during the day and building a fire in the wood stove and watching a movie at night. We enjoyed Grand Superior #502 - a nice, quiet location at the resort. We have previously rented from Grand Superior's townhouses, but then you deal with neighbor noise issues at times. This stand-alone cabin was quiet and peaceful, set off to the far side of the resort property. Our only recommendation is providing a little more in the kitchen area - better pots/pans and some other cooking items. Grateful that the property manager brought us a fan when we complained it was so hot! They were also polite and quick to respond when our keyless entry quit working. Cabin was beautiful, well appointed and in a great location! Loved this home! It was comfortable from the moment we walked in. We do a lot of hiking so we particularly appreciated the jetted tub to soothe aching muscles. The view of the lake is so nice - we watched the sunrise each morning - beautiful. We loved the home. Not right on the shoreline but we could see the lake pretty well. It was fully stocked with everything. Even had a rolling pin and holders for corn on the cob. Only thing missing was an iron, griddle and working can opener. Couldn't believe how well the kitchen supplies was stocked. No A/C but it had a ceiling fan and two floor fans which we put by the windows to cool us down. Could use a A/C window unit or indoor A/C recycler. If it wasn't for the cool 72degree night we would have died. Good amenities and fun outdoor games. House had some games too. Linens and towels smelled freshly laundered and the towels were super soft. We will definitely be back. Great place that met all expectations. Did not need or request any services. I am an experienced North Shore visitor.